Over the past decades, the increase in economic inequalities was largely driven by a rise in income and wealth accruing to the top of the distribution. However, household surveys, the data sources traditionally used to observe inequality dynamics, do not properly capture these evolutions. Surveys provide useful information and cover many countries, but they do not inform adequately on income and wealth levels of the richest individuals. WID.world overcomes this limitation by combining different data sources: national accounts, survey data, fiscal data, and wealth rankings. By doing so, it becomes possible to track more precisely the evolution of all income or wealth levels, from the bottom to the top. The key novelty of WID.world is to use such data in a systematic manner, allowing comparisons between countries and over long time periods. 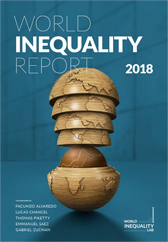 In order to achieve this objective, we build upon the new wave of research on long-run inequality trends developed during the past 15 years by an international group of scholars. Comparing concepts of income and wealth in different countries and over time is not straightforward. The concept of gross domestic product (GDP) that is commonly used to compare levels of economic welfare across countries is not satisfactory. We prefer the concept of national income (NI), i.e. GDP minus consumption of fixed capital (capital depreciation) plus net foreign income. National income is more meaningful because it takes into account the depreciation of the capital stock (including in principle natural capital), which is not an income to anyone, as well as the fraction of domestic output that is transferred to foreign capital owners (including in principle offshore wealth). For instance, a country with a large GDP but extensive capital depreciation and foreign outflows does not have much income to distribute to its residents and citizens. The national income concept reflects this. Next, and most importantly, the central problem of gross domestic product (total and per capita) is that it deals solely with aggregates and averages: it does not tell us anything about the extent to which the different social groups benefit – or not – from economic growth. In contrast, WID.world develops a methodology based upon the notion of Distributional National Accounts (DINA). The central objective is to describe the evolution of the distribution of national income and wealth, i.e. how the different percentiles of the distribution – from the bottom to the top – evolve over time and across countries, using concepts of income and wealth that are socially and economically meaningful and comparable across countries. We are very much aware that there are strong limitations to our ability to measure the evolution of income and wealth inequality. Our objective in WID.world is not to claim that we have perfect data series, but rather to make explicit what we know and what we do not know. We attempt to combine and reconcile in a systematic manner the different data sources at our disposal: national income and wealth accounts, household income and wealth surveys, fiscal data coming from taxes on income, inheritance and wealth (when they exist), wealth rankings. None of these data sources and associated methodology is sufficient in itself. In particular, we stress that our ability to measure the distribution of wealth is limited, and that the different data sources at our disposal are not always fully consistent with one another. But we believe that by combining these data sources in the most explicit manner we can contribute to a better informed public debate. The research papers upon which our series are based are available on-line and present our methods and assumptions in the most transparent manner. All raw data sources and computer codes are released so that our work can be extended and improved by others. We also aim to put pressure on governments and international organizations so as to induce them to release more raw data on income and wealth. In our view, the lack of transparency about inequality of income and wealth is one of the greatest challenges to peaceful democratic discussion in today’s globalized economy. In particular, it is critical that governments provide public access to reliable and detailed tax statistics, which also requires that they operate a properly functioning registration system for income, inheritance and wealth. Short of this, it is very difficult to have an informed debate about the evolution of inequality and what should be done about it. In recent years, we were able to gain improved access to income and wealth fiscal data in a number of countries in Asia, Latin America, Africa, Europe and North America, including China, India, Brasil, Russia, Mexico, India, Lebanon, Ivory Coast and South Africa. But this is still insufficient, and we very much hope that we will be able to provide better series in the future. We should make clear that the long-run objective of WID.world – i.e. the production of annual Distributional National Accounts (DINA) describing the entire distribution of income and wealth, from bottom to top, using concepts consistent with macroeconomic national accounts – will be implemented gradually. The history of our database started in 2011 with a focus on top income shares series, which was subsequently extended to aggregate wealth series in 2015. As of now, the database includes relatively detailed DINA series for the full distribution of income in more than 20 countries or regions, including the USA, France, China, India, Russia, Brazil, Côte d’Ivoire and the Middle-East. Distributions of wealth are also available for the USA, France, China, Spain, the UK and Russia. Similar series will soon be made available for a number of other developed and developing countries. The database still focuses upon top income shares series for over 50 countries, and series on the structure of aggregate national wealth and national income for over 20 countries. For more than 200 countries and world regions, we also provide series on aggregate national income. Recent findings from the WID.world database are presented and discussed in the World Inequality Report 2018. By developing this report, the World Inequality Lab seeks to fill a democratic gap and to equip various actors of society with the necessary facts to engage in informed public debates on inequality. For more information, please visit wir2018.wid.world. Interested users will find more information in the WID.world library below. The library includes a large number of country-specific research papers and methodological documents that provide detailed information about the methods, concepts and data sources used in WID.world. WID.world Working Papers are research articles produced by WID.world fellows that present and discuss new inequality series for specific countries or at the global level, or focus on general developments of the WID.world methodology. They are intended to make findings of the WID.world community available to researchers and the general public and to encourage discussion. WID.world Technical Notes are shorter documents aimed at providing additional technical information about our series (typically about updates of previously released series). We also provide the WID.world computer codes used to create the entire database from both researcher’s data and official sources. They are regularly updated and freely available on the GitHub platform.